Kettler have just launched their new range of bicycle ergometers that includes the new Golf ST Pro. The Kettler Golf S Pro has always been one of the most popular bikes on the market. But the new version, the Golf ST Pro, offers even more. The motor controlled magnetic brake system provides resistance in 15 steps. You can get fit with a choice of 8 pre-set training programmes that includes pulse-controlled training and pulse-range settings for stamina training and fat burning. All the information you require about your workout is displayed on the exercise bikes smart computer including calorie consumption calculated with reference to resistance for a more accurate reading. The low mounting height adjustable saddle positions, variable hand sensors and wide handlebars make the Golf ST Pro a real all-rounder for young and old. Cycle the Tour de France in the comfort of your own home! Kettler have just launched their latest range of fitness equipment that includes Tour Concept 1.0 software which is compatible with their Ergo Racer GT. Tour Concept 1.0 is the first GPS-controlled training software for ergometers, cross-trainers and treadmills that have a compatible computer interface. You can cycle your favourite training route or even a section of the Tour de France. No need to worry about the road conditions, wind or weather and all possible in the comfort of your own home! You can record the GPS data on one of your training trips or plan a trip in interactive map system mode. 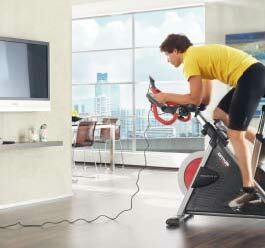 Then cycle over the route you have planned using animated 3D maps, in the comfort of your own living room. All the training data can be recorded for later reporting and analysis. Now you can have an outdoor experience in the comfort of your own home.